I find it hard to believe that as I sought the Lord about a word to represent the year ahead, the word impressed upon me was “Less”. First of all let me say that I love words. There are a lot of good words I can think of to contemplate, focus and project into my new year. Less is not one of the words I would choose. Course, that is the key. My choice. I am OK with that because typically when given and assignment like this I go a little Ga-Ga! As a matter of fact at a Fitness Conference last year I had an epiphany. The suggestion was to have one word, and set your intention for the new year. So what did I do. First I grabbed a rock from the Boston hotel’s lobby and then I proceeded to think about some of my favorite words. Did I choose one? No. I wrote FOUR words on one side and a phrase on the other side of that sweet, oval rock. Sometimes, I think God just really has His hands full with me, but then I realize, hey, He’s God – He can handle the mess of me! How ironic that in a culture, society and time that says “Be all that you can be”. Be more, do more, get more I hear God telling me the word that is my word if I will accept it, is less. Don’t think, this is where the conversation ended. See I am not so submissive like that. But, I debate, Lord- I like words and can think of lots of words that might be good for this next year in my life. Remember last year? 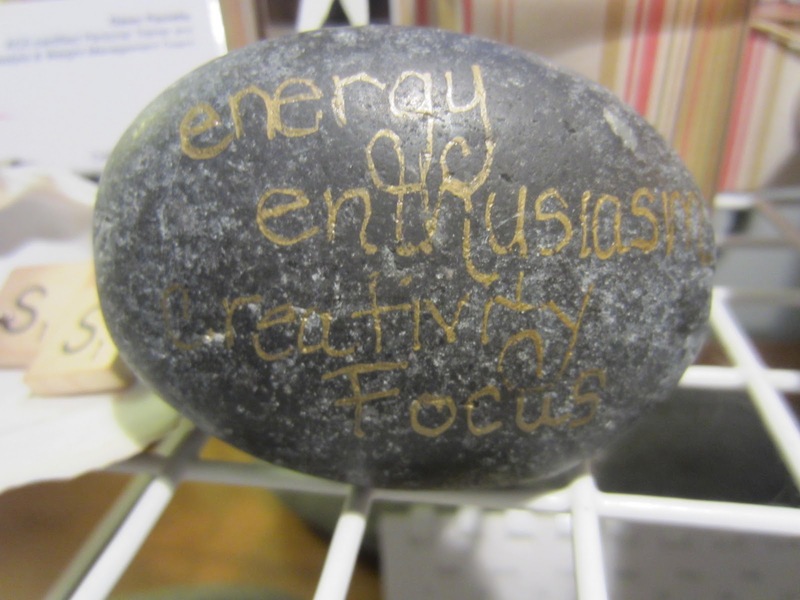 I chose: energy, enthusiasm, creativity and focus. Good words, right? By the middle of the year I was sapped of my energy, my enthusiasm had run out, my creativity at a stand still and my focus unidentifiable. Um, Lord, I am listening. Less. Got it. I’m not sure I get it but I’m willing to listen and have it your way, Lord. So, I started to consider how less could be best for me and lead to more of God’s will for my life. If I complain less, I can praise Him more. If I hurry less, I can enjoy the present moment more. If I criticize less, I can encourage more. If I judge less, I can love more. If I talk less, I can listen more. If I want less, I can give more. If I condemn less, I can forgive more. If I doubt less, I can believe more. If I fear less, I can receive more. You see in the end, God knows what’s best and the less he is asking me to embrace is a less that will lead to more. More of Him. Now that’s less that I can live with. Or without. Oh, you know what I mean! So, this year I start with the word that is best for me. I think this year He has a few Less-ons to teach me. Thank you for this One Word for 2012 Challenge , Bonnie! Previous The Beauty Of A Blank Page Next "I’m IT !" Less is a wonderful word. I enjoyed your thoughts on less. Each one is challenging. Less is a good word. We could all use that one. I'm so amazed at how many different “one words” there are. This is the first “less” I have seen. What a beautiful choice! May God be honored all year through it. Lol! Interesting word – Less. I love that when God speaks you know it is Him because it is something you would NEVER SAY! He makes it nice and clear sometimes! Yay!My word is TRUST and i felt let down because it does not seem like a fierce or powerful ACTION word, but He is showing me different. Yay us! 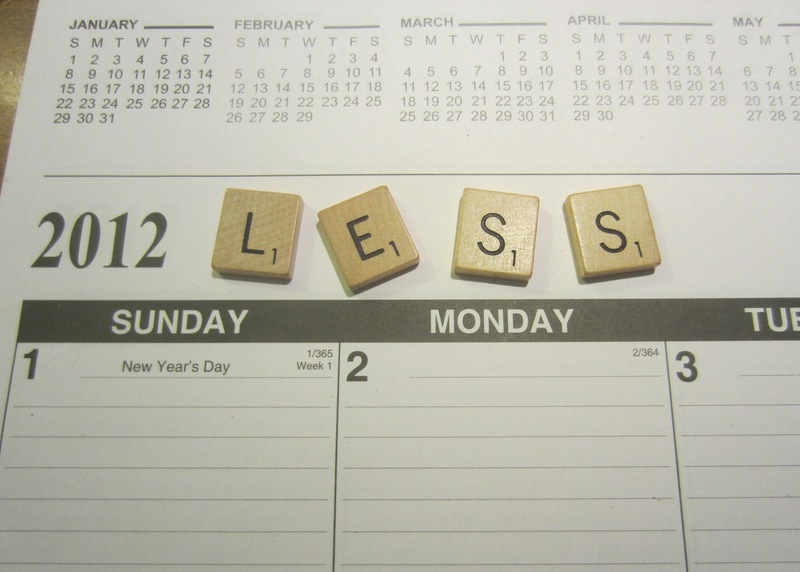 “Less”– I love it! It's humbling. Oh this is a good one! You know – the fact that MORE is praised in our society rather than LESS just makes the word LESS more important – because we are called to be set apart from this world. It's something I struggle with too, because I get so caught up in the “stuff” of this world and “fitting in” with what everyone else has and forget that what I already have is the best thing and the ONLY thing I need – Jesus. Less is a great word! Less of ourselves, more of Him. Love it!! Less is a great word. Love your blog. I love the concept of “less”. It speaks of a quiet mind. I love that you wrote your word on a rock! Less is a great word. More of Him. Dawn! 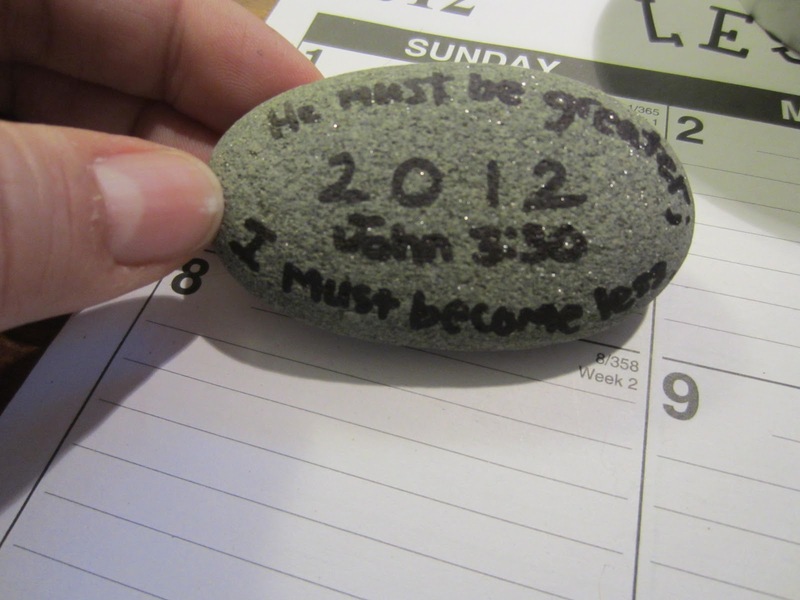 I love how you wrote your word on a rock… I'm thinking the Rock of Jesus. 😉 Less is hard because of the pressures of what the world says, but you have all of us on the faith walk cheering you on. We know the secret in less is really more. 😉 *hugs* Thanks for sharing your one word! Amen! What a post … I am glad I found this blog. I found you on F.O.C.B and I am just working my way through blogs having a read, and introducing myself. I also want to try and encourage my fellow bloggers when I can so I want to take this opportunity to to do just that. I have wrote a poem that I believe will encourage you and uplift you… not that the praise should be mine but to Him who inspired it! It's called Child of the King. You can have a look here: http://www.barrymccormick.com/child-of-the-king/ Looking forward to reading more of your posts!